We’d love your help. Let us know what’s wrong with this preview of The Little Black Book of Marijuana by Steve Elliott. Handy and to the point, The Little Black Book of Marijuana gives you "the dope" on pot, from possible side effects and ri This concise guide to cannabis delves into pot culture and history, from Herodotus to the hippies and beyond. 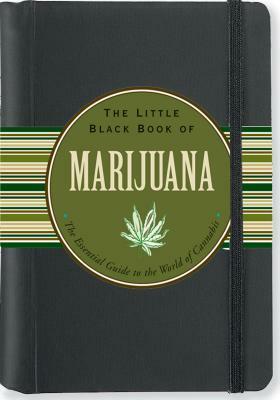 To ask other readers questions about The Little Black Book of Marijuana, please sign up. A great little book with lots of useful information. Seriously, this book should be in EVERY health class in the nation... at the VERY least, in EVERY responsible parent and grandparent's home. EVERY person in this land should know and understand the contents of this short book that is PACKED with the FACTS about Marijuana. It even contains a section that dispels the myths! Great Book, a MUST read for ALL!!! Short and interesting, I didn't like the layout- and there was no ToC on my Kindle. Good short primer,though I don't know about how comprehensive it is. Steve Elliott is a journalist and editor of the independent cannabis blog Toke Signals (http://tokesignals.com), bringing you uncut, uncensored, non-corporate-controlled cannabis news. Steve was the cannabis/dispensary critic ("Toke Signals") and medicated edibles critic ("Incredible Medibles") for Seattle Weekly from 2010 to 2013. Elliott was also editor of Hemp News ( htttp://www.hemp.org/news ). Steve Elliott is a journalist and editor of the independent cannabis blog Toke Signals (http://tokesignals.com), bringing you uncut, uncensored, non-corporate-controlled cannabis news. Elliott was also editor of Hemp News ( htttp://www.hemp.org/news ). He does the National News section for NW Leaf, Oregon Leaf, and Alaska Leaf Magazines, and is a former writer for DOPE Magazine and HERB.co. He is author of The Little Black Book of Marijuana: The Essential Guide to the World of Cannabis [Peter Pauper Press, 2011]. For three-plus years, from 2009-2013, he ran the Village Voice Media cannabis blog, Toke of the Town. You can follow him on Twitter @alapoet .